This fractal fantasy is inspired by the right-angle geometry of Aztec art. 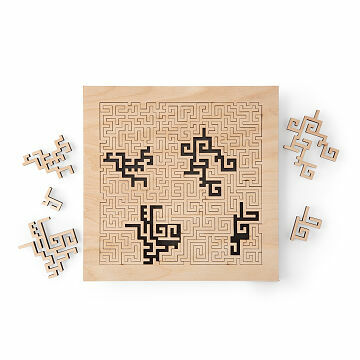 Fractal geometry meets jigsaw art in this plywood puzzle inspired by the decorative motifs of the ancient Aztecs. Unlike conventional pictorial puzzles, the challenge is to complete an interconnected but ever-shifting geometric field. Finished with a warm brown toner, the mesmerizing composition offers a challenge to entice any puzzle lover. Made in Grand Rapids, Michigan. This is such a cool puzzle! I gave it to a professional mediator, for his clients to use during the process. Although pieces are not fractals.. each piece is unique. Even after solving 4 times, it is still challenging as if doing the puzzle for the first time. Wooden pieces have a nice feel and fit easily together when placed properly. Fun, great unique gift! Bought multiple sets for gifts and they were a hit!